Push your home studio at upper level at lower cost, the low level of cost can be as little as 100 dollars or even less. Here is how. In our previous article, we talked about how to create a home DIY studio at minimal cost. With $300, you could have the bare essentials to learn how to manage a single artificial light. Even with such a setup you can have fun and above all you can get great pictures. Obviously you have to bear some compromise. If you want to expand your possibilities you have plenty of options, from the cheapest and simplest to the most expensive. In this article we will explain the major improvements or manipulations possible for your small home studio. We will always have an eye at reducing the costs. Many of the items in this list are cheap or at least have a version of the lower price tag that allows you to continue playing with the artificial light. Without the previous setup, for smaller objects; actually you can use these resources singly or in combination. So our promise of $ 100 or even less budget is not actually a mockery ! For example, a 5 in 1 reflector is used mainly for food photography. It has usefulness and effectiveness that is exceptional at that cost. Especially taking into account that you might need to pay only $50.00. 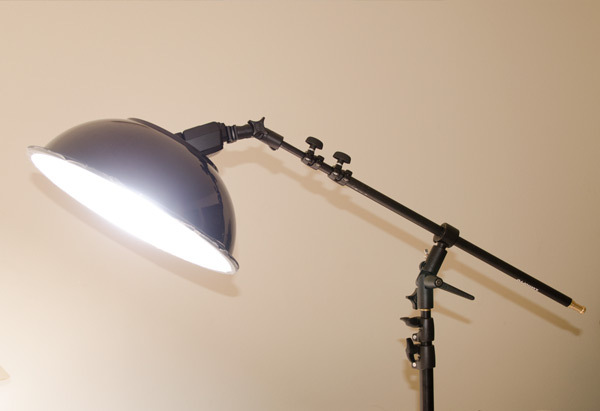 By adding some elements to the single flash diffuser can have more control over light and shooting on the set. One is that 5 in 1 reflector we wrote above. A Collapsible Reflector is an accessory that has something brilliant in it. The structure is like a disk of foldable material. The reflective part is formed by a coating which covers the disc. The coating has one side golden and one black but internally has a white on one side and one silver. So, turning it over, you have access to these two sides. So, three sides of different color with one black that absorbs the light. This is the reason it is called 5 in 1. Thanks to the reflective sides, in particular, it can create a secondary light source to help the flash. In fact, the silver side and golden side reflect a lot of light and do more than just brighten the shadows. Often the background at home, becomes the furniture, various elements that are not good for photos. The best way to have a clean background is to use an artificial one. In fact, in the market there are two stands and a foldable cloth like material is available. They are a very popular solution for portrait photography, you will see them in many “behind the scenes” series. These are known as photographic backdrops. As always, there are branded models, costing hundreds of Dollars. To begin with, we will suggest a solution that allows you to stay under $100. It is always compromise in build quality, but the cheap products in general, give good performance in relation to price. Now, the name of this accessory is controversial, this light tent is equivalent to softbox. However, this is a “box” of white translucent fabric of various sizes, in which to we can photograph small objects. Our DIY Light Box is obviously better to consider. The material making up this box acts as a diffuser, so you do not need anything else to diffuse the flash. In addition, it is easy to insert a depth that gives the impression of an endless background, without folds and joints. Now, this thing can be made DIY too. You have seen a kind of mainly China manufactured foldable bin like thing (I do not know what its real name is) with net like wrapping material and a frame with a metal that is designed to be kind of twisted and folded. Usually they are used for keeping clothes to be washed the next day. You got the point – strip off the net like fabric and use white cloth. It is quite difficult to do – there is no way of gluing, you have to sew it in hand. But that effort actually gives better result even than an average light tent. We recommend starting slowly, do not buy immediately a heap of tools and accessories, gradually grow. The flash photography in particular, introduces problems which are totally different to photography with natural light. Also, as we have mentioned, when you increase the number of flashes, the situation becomes even more complicated. So, starting with an excess of instrumentation could not even make you understand the potential of this type of photography. This Article Has Been Shared 6202 Times! Cite this article as: Abhishek Ghosh, "Push Your Home Studio at Upper Level at Lower Cost," in The Customize Windows, August 9, 2013, April 18, 2019, https://thecustomizewindows.com/2013/08/push-your-home-studio-at-upper-level-at-lower-cost/.